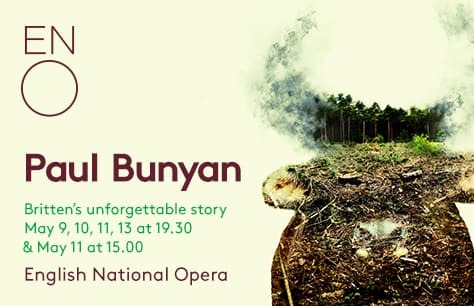 ENO Studio Live brings Benjamin Britten's hit operetta Paul Bunyan to the newly renovated Alexandra Palace Theatre! Following its sell-out run at Wilton’s Music Hall in 2018, ENO will again perform Paul Bunyan, Britten’s retelling of the legend of the eponymous giant. As part of ENO's Studio Live series, we present the immense power of opera in intimate theatre environments while celebrating emerging and established UK talents.